On Monday, October 9, 2017, a local resident was walking the shoreline of Silver Lake in Kingston when they noticed thousands of dead fish near Silver Lake Sanctuary. Further investigation by state fisheries biologists confirmed that approximately 2,500 river herring were dead along the Southeastern shore of Silver Lake. But where did they come from? Brockton’s dam on the river and constant drawdown of Silver Lake for use as a water supply has interfered with river herring coming and going from the Jones River to Silver Lake for over one hundred years. If the natural passage of river herring into Silver Lake has been blocked for over one hundred years due to Brockton’s use of Silver Lake as a water supply how did all these dead river herring get there? In addition to taking water from Silver Lake (Kingston, Pembroke, Halifax and Plympton), Brockton’s need for water further taps ponds in Pembroke, Halifax, and Hanson. From Monponsett Pond (Halifax & Hanson) Brockton can seasonally divert 30 million gallons per day (MGD) into Silver Lake, and another diversion from Pembroke’s Furnace Pond can divert 10 MGD into Silver Lake. While these diversions may only take place from October to May, up to 11MG is pumped from Silver Lake to Brockton daily. Taking these huge volumes of water from local ponds depletes the streams that rely on them, including Stump Brook and the Taunton River and Herring Brook and the North River. Meanwhile, the once pristine, crystal clear Silver Lake not only is in a perennial state of drought but is being impaired by the inputs from these smaller ponds with poor water quality. Silver Lake suffers from periodic drawdowns of more than twenty feet, killing most of the organisms in the lake and altering regional groundwater flow. The summer of 2016 Brockton drawdown of Silver Lake killed an estimated 50 million freshwater mussels many of which are state-listed species of special concern, as well as endangered red-belly turtles. The Dead Herring are from Pembroke! But back to the dead to fish in Silver Lake. We know that fish didn’t come up the Jones River over the Brockton dam. So they must have come into the lake through one of the water diversions. 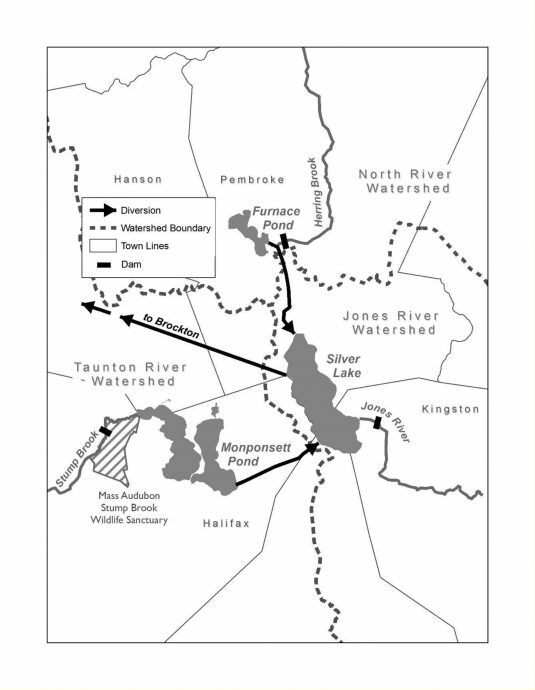 There are currently no river herring in Monponsett Pond because they are blocked by other dams (that’s changing right now!). So the fish must have come from Furnace Pond, Herring Brook, and the North River. The river herring populations in that system have rebounded phenomenally in recent years due to several grassroots groups including the North and South Rivers Watershed Association (NSRWA) and the Pembroke Fisheries Commission. They have been pulling out dams, clearing clogged stream beds, rallying volunteers for fish counts, and building partnerships with towns, business, state and federal agencies to accomplish holistic river restoration from the ocean to the ponds. Now the Pembroke herring run is one of the best in the state with over 300,000 fish counted in the spring of 2017. That is a lot of time, effort, and money expended towards restoring our herring runs; a critical ecological and economic challenge. To have this work result in thousands of fish stranded and dead on the depleted shore of Silver Lake simply because of lazy water management is unacceptable. And ‘lazy water management’ is all it is. There is no excuse for it (although lots of excuses are given). Simple solutions, like screening on the diversion pipes, would prevent fish from being transferred between the lakes. Pembroke has asked Brockton for this simple fix for years to no avail. At a bigger scale, the water transfers themselves are lazy. The Jones River Watershed Association (JRWA) has been working tirelessly for 30 years to find feasible solutions that allow enough water for both human consumption and sustainable ecological health. Studies have shown that through a combination of reasonable conservation, use of the Aquaria desalination plant, and a more active (i.e. not lazy) approach to the timing of diversions Brockton could be securing its own water needs without the massive ecological impact to the 5 towns on the ‘supply side’ namely Kingston, Pembroke, Halifax, Hanson, and Plympton. Mismanagement of water resources is unfortunately far too prevalent throughout the state and South Shore due to a broken statewide system of water management. The state’s Department of Environmental Protection is not protecting our waters for the long haul by maintaining the status quo in Brockton or in the myriad of other towns they allow to withdraw more water than can be taken without harming the wildlife that also relies on that water. The drought of 2015-2016 brought into striking relief just how tenuous our water supplies are with rivers and reservoirs running dry, people running out of water was not far behind. We believe that fish kills and their extirpation in local waters is the canary in the coal mine for us to realize that our water is finite and scarce. Water is in the cross hairs of climate change, already we are starting to see the predictions of heavier rainfalls and intense droughts come true. Our current inadequate system of water management will be further exacerbated by climate change, placing more wildlife and people at risk unless we change how we manage our most critical resource. Do we have the political will to save our water resources for ourselves and our children? Our water resources are the most fundamental aspect of daily life: public health, the environment, and our local economy will not thrive without reliable supplies. The on-going practice of water mismanagement on the scale of Brockton put all of us in jeopardy. Our community of grass-roots organizations have put together a petition to urge our legislators and enforcement agencies to represent and protect vital water resources. A copy of our petition is attached. We urge you to sign this petition electronically through your local organization. By requiring that the state enact conservation policies that protect fish and people, encourages water reuse, and requires water management that restores the ecological health of public waterways. This notice of complaint will be sent to the Central Plymouth County Water District, Massachusetts Division of Marine Fisheries and Massachusetts Department of Environmental Protection, Massachusetts Environmental Affairs, Governor Baker, State Senator, State Representatives, and MassDEP.